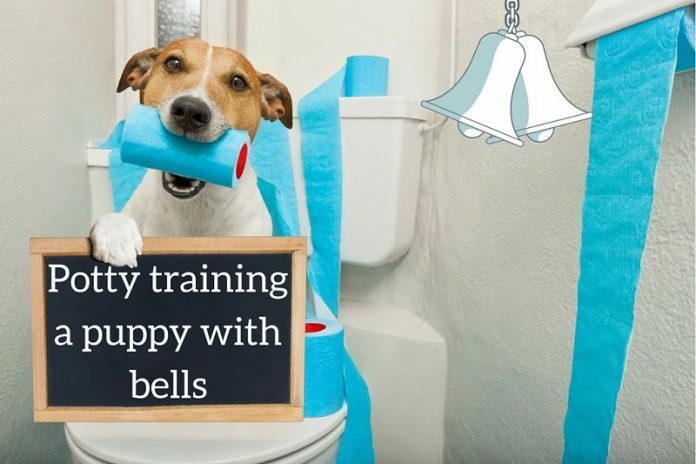 If you’re struggling with potty training your dog, do it the easy way – with bells! Puppy potty training with bells can be easier and quicker than other methods. You’ve brought your adorable new puppy home and things are going great. He’s cute, playful and a great companion. But one area is not going so well – potty training. You’ve read all the information there is about how to train a dog to use the bathroom outside. And you’ve followed all the conventional advice about taking your puppy out often. But still he won’t go to the door or alert you to his need to go outside. It’s time to learn how to bell train your puppy to ask to go out! Training your puppy to ring a set of bells to alert you to his need often hastens the potty training process. Read on to learn more about bell potty training a puppy to poop outside. First, you need some bells! You can purchase bells for this purpose at most pet stores or Amazon have some great products. You can even simply make your own by taking a strap or thick ribbon and sewing on several jingle bells. You loop this strand of bells around the door handle of the door you wish your puppy to use. Make sure the bells hang low enough for him to reach them easily. Then you are ready to begin training. To start training, continue taking your puppy to the bathroom frequently. As you lead your puppy out the door, ring the bells and say, “Outside.” Do this each time you take your puppy outside to poop. When you’re in the desired spot for him to go to the bathroom, give him a consistent command such as “Go potty,” or something similar so he learns what your command means. Make sure to praise your puppy and even offer treats as soon as he goes to the bathroom in the desired spot. Confine him to a small area when you cannot watch him closely or consider attaching his leash to you to keep him near. Take your puppy outside on a regular schedule and immediately after waking up or eating. After a couple days of ringing the bells for your puppy when it’s time to go outside, take his paw gently and have him ring the bells as you lead him out. Continue to praise your puppy for going to the bathroom in the right location. Repeat this process for the next couple of weeks until your puppy is consistently ringing the bells on his own and going outside to use the bathroom. Remember to keep a close eye on your puppy at all times to prevent accidents in the house. Bell potty training your new puppy typically results in much quicker training as they learn exactly what to do to alert you to their need to go outside. Be consistent, be positive, and praise your puppy as he learns how to navigate his new world and your expectations. With some diligent work up front, your puppy will truly become a treasured member of your family.